Independently Yours Medical Supplies has the largest inventory of rental lift chairs in the Boulder, Colorado area. Providing free delivery, set up and pick up we can have you sitting comfortably in a Golden Technologies Monarch Lift Chair rental with just a 1 – 2 days notice. Featuring an easy to use 2 button remote, you can gently sit, recline, and lift yourself up with just a press of a button on this Golden Technologies lift chair, dressed in a Vinyl material making it extremely easy to clean and sanitize. Boulder Lift Chair Rentals are available for rent by the week or month. Visit our store to test one out or call us to reserve your rental today. – Weight Capacity: 375 lbs. 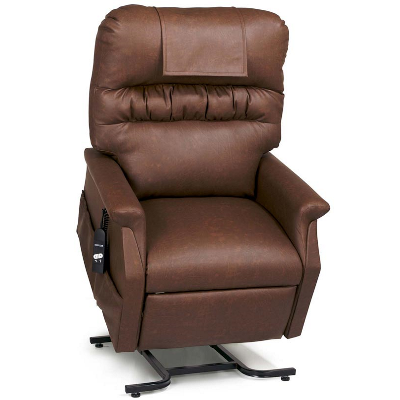 Boulder Lift Chair Rentals are the perfect short term remedy for post-surgery, trouble getting up the stairs to your bedroom, or need assistance getting up and down from your chair/couch and need something that is comfortable to relax in. Independently Yours Medical Supplies provides free delivery, set-up and pick up for rental lift chairs to Boulder, Louisville, Arvada, Golden, Commerce City, Broomfield, Westminster, Brighton, Longmont, Lafayette, Erie, Superior, and Denver.